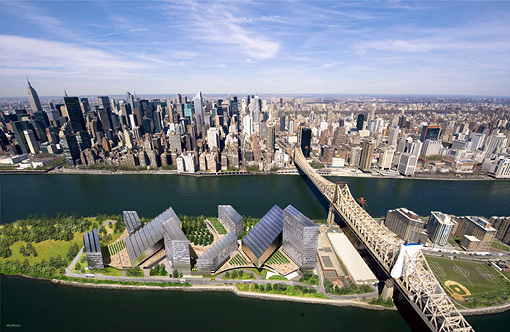 An aerial view of the proposed NYC Tech Campus on Roosevelt Island. Photo illustration by Cornell; photograph by Getty Images. On Oct. 28, Cornell will officially submit its proposal to create a world-class applied science and engineering campus in New York City. In partnership with The Technion-Israel Institute of Technology, the campus promises to spur economic development, job creation and high-tech entrepreneurship in the heart of the city. Cornell had been preparing its proposal for months to answer New York City Mayor Michael Bloomberg's call for a campus that would commercialize research and technologies and benefit the city's economic development. The plan has seen a groundswell of support from alumni and countless others in the form of websites, blogs and online petitions. "I am enormously grateful to our board of trustees and to the thousands of alumni and friends, both in New York and elsewhere, who have so strongly supported our proposal," said President David Skorton. "I am also grateful to our faculty, staff and students, who have been equally supportive. This is just one more reason why Cornell is the logical choice for this honor. Educational leadership and outreach in support of the people of New York are essential to Cornell." Bloomberg is expected to announce a winner by the end of 2011. 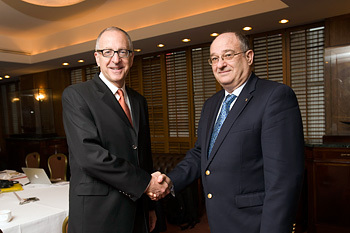 Cornell President David Skorton, left, and Technion President Peretz Lavie confirm a new partnership to create a world-class applied science and engineering campus in New York City. Cornell and The Technion-Israel Institute of Technology announced Oct. 18 a new partnership to create the New York City tech campus together. The NYC Tech Campus on Roosevelt Island will combine the full spectrum of both institutions' academic strengths. It will leverage Cornell's entrepreneurial culture and deep connection to the city's emerging tech sector, and Technion's global leadership in commercialization and technology transfer. "By joining forces in this groundbreaking venture, our two great universities will employ our demonstrated expertise, experience and track record of transforming new ideas into solutions to create the global avenues of economic opportunity and tech leadership that Mayor Bloomberg envisions," said Skorton. "The Technion is the driving force behind the miracle of Israel's technology economy. Its academic rigor in computer science and engineering and its leadership in technology transfer has helped create one of the largest concentrations of startups anywhere and attracted the world's leading technology companies to Haifa to leverage Technion's research and its outstanding graduates." An integral part of the campus will be the Technion-Cornell Innovation Institute (TCII), a 50-50 collaboration between the two universities to form a graduate program that will focus on commercialization of immediate relevance to the city's economic growth. Initially, the NYC Tech Campus will offer Cornell degrees in technical fields such as computer science, electrical and computer engineering, and information science, but the academic programs for these degrees will have unique interdisciplinary requirements related to each of the campus's academic hubs. Once the proper New York state approvals are received, students also will be able to pursue a dual degree from both Technion and Cornell. 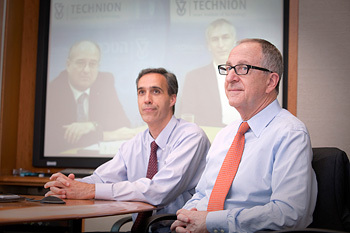 On Oct. 26, Skorton and Technion President Peretz Lavie, along with Cornell Dean of Computing and Information Sciences Dan Huttenlocher and Technion Dean of Electrical Engineering Adam Schwartz, delivered a joint message via videoconference as they prepared to submit the proposal. Oriented toward the arc of the sun, Cornell's proposed New York City Tech Campus on Roosevelt Island will capture a large, daily dose of solar power and will use the Earth's generous internal, thermal power as an additional energy source. The main educational building, a home for the Cornell and the Technion partnership, is being planned to harvest as much energy from the campus site as it consumes: In the parlance of energy experts, it will be "net-zero energy." 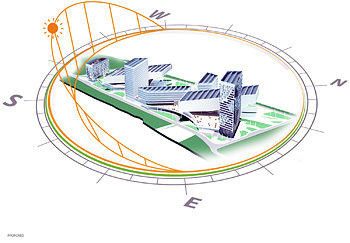 The proposed campus will be oriented toward the arc of the sun. If built today, the campus's proposed 150,000-square-foot core academic building would be the largest net-zero energy building in the eastern United States and among the top four largest such buildings in the United States. "This proposed campus goes beyond buildings and reduced energy use -- it's a living laboratory that brilliantly anticipates and integrates forward-thinking design and building technologies," said Kent Kleinman, Cornell's Gale and Ira Drukier Dean of the College of Architecture, Art and Planning. The campus's planned solar array will generate 1.8 megawatts at daily peak -- the largest such array in New York City. A four-acre geothermal well field -- composed of deep-earth wells -- exceeds any current geothermal heating system in New York City. The initial phase of the proposed campus will require only a quarter of the electricity from the grid, emit half of the greenhouse gas, and require less than half the fossil fuel to power, heat and cool than a comparable new, conventional campus that meets current energy code. The Cornell Board of Trustees voted unanimously to support Cornell's NYC Tech Campus during a special meeting held in New York City, Oct. 12. Discussing the decision immediately following the meeting are, from left, Provost Kent Fuch; Robert S. Harrison '76, incoming board chair; Jan Rock Zubrow '77, chair of the board's executive committee; President David Skorton; trustee Andrew Tisch '71; and Peter Meinig '61, board chair. During a special meeting of the Cornell Board of Trustees at Weill Cornell Medical College Oct. 12, the board voted unanimously to endorse Cornell's NYC Tech Campus plan. "Today is an extraordinary day for Cornell University -- not just for 2011 but for the next 150 years," said an exuberant Skorton, minutes after the meeting adjourned. "The board of trustees has unanimously and enthusiastically endorsed the proposal for Cornell to create the tech campus of the future right here in New York City." 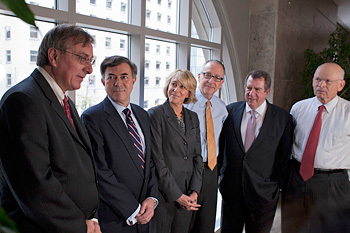 Skorton was flanked by key board leadership, whom Skorton described as the group that helped lead the way to garner support from within and outside the university for the new campus. "I have not seen this level of enthusiasm by any action taken by this board in the nine years I've been on it," said Bob Harrison '76, who will succeed Peter Meinig '61 as chairman in January. "I'm proud to have been part of what I think is a historic decision." Meinig said the board had "done its homework" over the last 10 months regarding the proposal. "It's very clear that we're making a very, very visionary move for Cornell," Meinig said.